It's raining candy! Hallelujah! 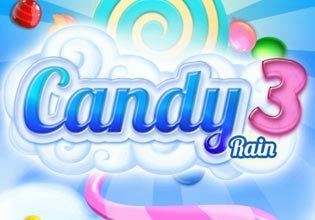 The fantastic match3 puzzle game Candy Rain is back with brand new levels and Candy Rain 3 is more fun than ever. Combine at least three delicious candies to make them vanish from the field. If you manage to combine even more candies at the same time, you will be rewarded with tons of points and of course with cool extras that can for instance wipe a whole line of sweets or make all candies of a certain color vanish. Don't rush your moves and always keep an eye on your score as the turn limit is challenging and sometimes you need to plan a few moves ahead.Play Candy Rain 3 now for free and enjoy the sweets without having to think about the calories!